Wildside Safari Camp offers comfortable family friendly accommodation in the malaria free Entabeni Game Reserve in South Africa. 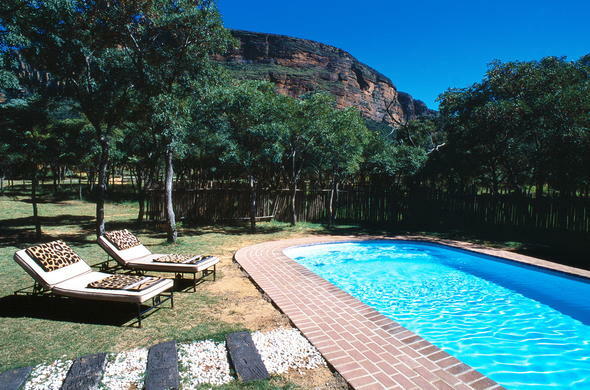 Wildside Safari Camp is ideally situated in the malaria free Entabeni Game Reserve. The area features beautiful waterfalls and crystal clear mountain pools. Entabeni Game Reserve is home to a diverse range of flora and fauna and 2 different ecological systems. This Limpopo safari safari lodge offers guests comfortable accommodation in tented chalets. There are also 4 family tented chalets, making this malaria friendly area ideal for family safaris. Each tented chalet is fitted with an en-suite bathroom. Wildside Safari Camp also offers guests a range of fun activities to participate in. Guests can enjoy game drives and bush walks or explore the area on horseback or quad bike. This Limpopo safari lodge is also perfect for small conferences or team building. The boardroom can sit 10 delegates. Children under the age of 6 are not allowed on game drives for safety reasons. Depending on the number of children staying at this Limpopo safari camp in South Africa, special game drives for children can be arranged. These drives can not be guaranteed. Children under the age of 12 are not allowed to participate in bush walks offered at Wildside Safari Camp.